Nobody involved in creating or spreading the invented controversy took the time to measure out where Apple's planned store would reach. Instead, "architecture critic" John King merely jumped to the conclusion that the new store "would displace one of downtown's friendliest works of public art." Measuring off 80 feet from the front of the Levi's building leaves 6 feet of space, enough for an average adult to lie down (and roughly where the woman is sitting, above) before arriving at the 15 foot wide "folk art" fountain. Another 30 feet of plaza would remain between the fountain and the Hyatt, which owns the plaza. As originally reported by Apple retail watchdog IFOAppleStore, the outline of the new store (shown in the city assessors map of the block, below) would actually return considerably more space to the plaza area than it would take back. And while King fondly referred the the fountain's "popular plaza," the reality is that space is both literally and figuratively cold and barren. Even on a beautiful day like today, there were very few people using the plaza even at lunch. Two of the six people in the plaza area appeared to be TV reporters capturing footage to report on King's tempest in a teapot. Looking out from the rear of the plaza (below), it's not difficult to see why it's not the "popular" space King described: it is shaded, uninviting, bleak and offers little to look at apart from the taxi line of the Hyatt. Across Post Street, the far more inviting Union Square was hosting an art show and dozens of people were sitting, chatting and soaking up sun on the adjacent steps where the urban landscape is broken up by grass and trees. King also castigated the design and aesthetics of the planned Apple store, calling it "boxy" in reference to the fact that the more conventional outline of the planned store replaces the triangular retail building currently occupied by Levi's. The structure was built as part of the adjacent Hyatt hotel in 1973. Apple plans to demolish the existing structure and replace it with a "box," no doubt because the existing pie shaped building is a very poor use of space, with much of the interior consumed by a spiraling stairway and glass elevator structure, leaving the remaining retail area broken up into areas further dominated by ramps and other efforts to make the oddly designed space accessible. 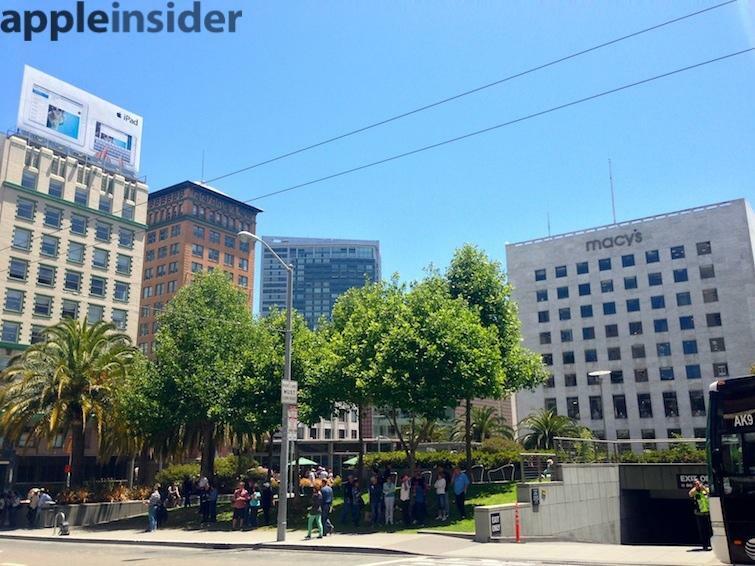 Levi's already has plans to vacate the building and open a new store two blocks away on Market Street, near Apple's existing retail store. Apple in turn, plans to build a larger store in that location to replace its increasingly cramped, current flagship. 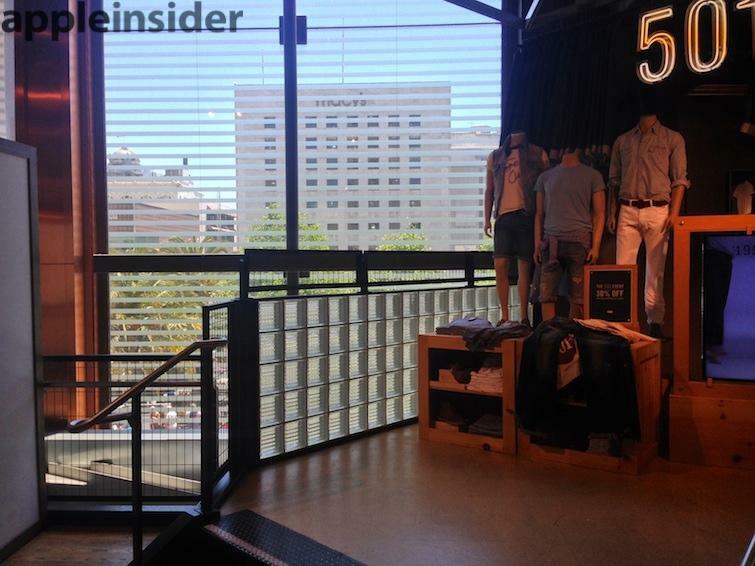 King also worried that the new store has an all glass front, "exposed to direct sunlight nearly the entire day." In stark contract, the existing Levi's store has boarded up its street level windows and doesn't even offer much of a view of Union Square from its higher floors due to its bizarre floor plans. More substantial urban design critics have recommend an even larger building than Apple has planned. 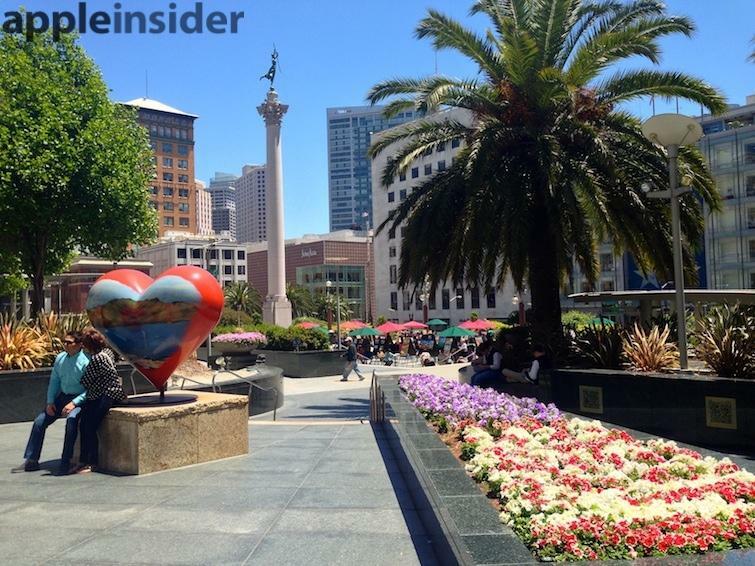 Union Square, which has the distinction of being the world's first underground parking garage, was intended to be surrounded by a street wall of taller buildings, similar to other famous urban plazas. Many of the stores and hotels surrounding the park are around ten stories, including the historic 11 story Tiffany Building next to it and the modern 8 story Macy's located across the square (the view from Macy's, below). The turn of the century portion of the Westin St. Francis hotel on the west end of the square is 12 stories. At the east end, an iPad billboard sits atop a building, more than ten stories in the air. The squatty Hyatt triangle was built in the 1970s during a period of San Francisco's urban decay, and reflects none of the urban grandeur of the rest of the square. 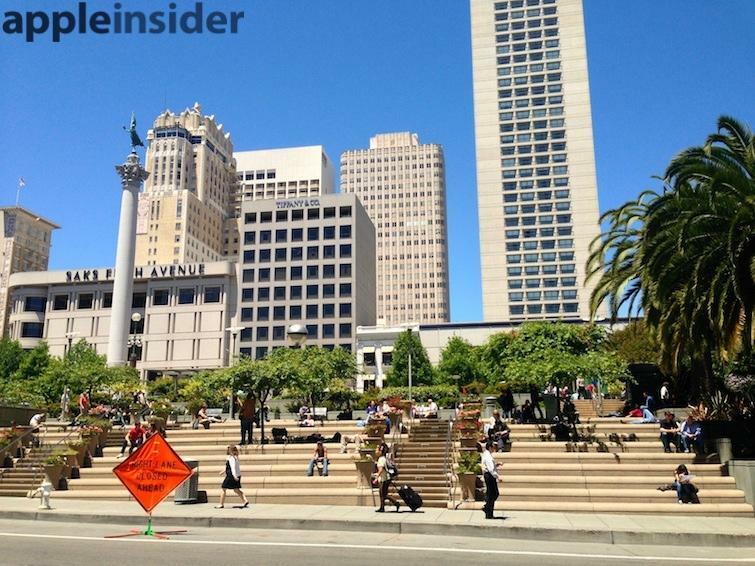 Unfortunately, there is little political will to push Apple to build a more substantial building on the corner, despite San Francisco's General Plan specifying a policy to "preserve retail service businesses in upper floor offices in the retail district." Instead, Apple is simply upgrading an oddly shaped structure into a far more inviting, if simple and still rather small, retail storefront that invites attention from the busy Union Square (below), rather than either thinking big in grand urban terms or trying to preserve every aspect of a dowdy, little used set of bleak steps surrounding an oversized fountain behind it. 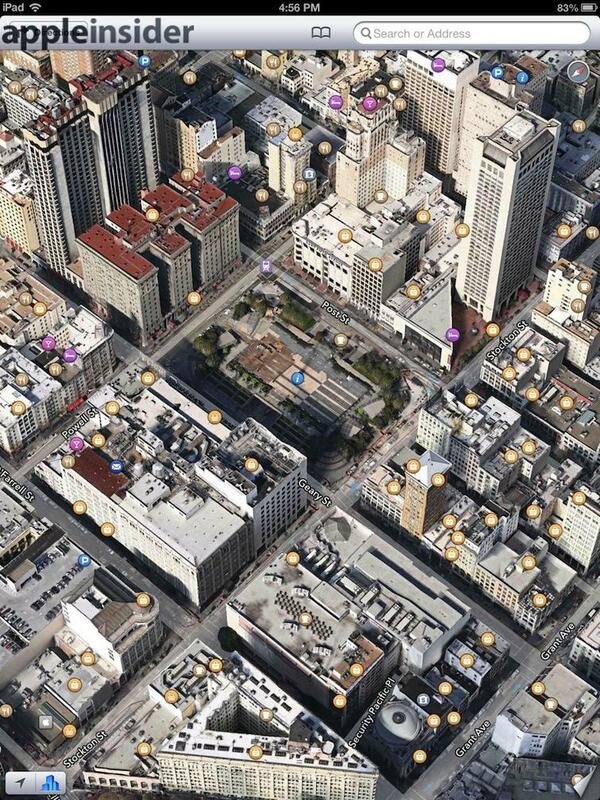 Viewed in Apple Maps Flyover (below), the existing Levi's building next to the Hyatt tower is located at the top right at the north east corner of Union Square. 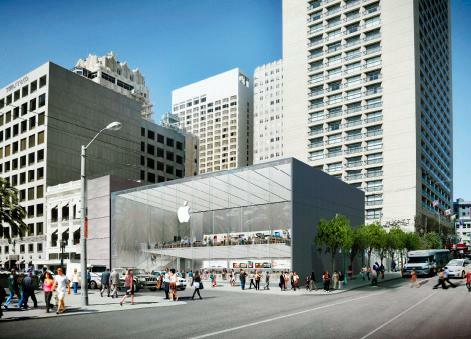 Apple's existing retail store is three blocks down Stockton street, in the lower left of the graphic. Apple has "gone big" in other locations, such as its Ginza store in Tokyo, which occupies several floors of an eight story building, or various new stores in prime urban locations in cities such as Berlin and Madrid. In all of these examples however, Apple was occupying space in a large existing building rather than building from scratch.